Gravina is situated on the borders of Basilicata, in the Western Murgia area; a territory with high Karst formation, characterised by the presence of numerous grottos, which gave refuge since Neolithic times (V millennium BC) to the local population who were devoted to agriculture and sheep farming. A permanent settlement developed on the Botromagno hills during the Iron Age, which over the centuries from the 8th to the 5th centuries before Christ, were, like many other centres in the region, gradually more influenced by Greek culture imported from the colonies. During this period it was known as Sidion when construction of its defensive walls occurred. The City maintained, as testimony of its importance, the right to mint its own currency (4th Century BC). In 305 BC, it was conquered by the Romans and included along the Via Appia (Appian Way) route, and given the name of Silvium. As with many other localities in the region after the Civil Wars (90BC), it became a municipium, and Gravina enjoyed a period of wealth and economic development during the Imperial era. The end of the Empire brought destruction by the Vandals, commanded by Genserico in 456, whilst its inhabitants sought refuge for centuries in the natural grottos in the area, giving start to the so called Rupestrian Civilisation. After the Greek-Gothic Wars (535-553), fought and won by the Byzantines against the Ostrogoths, Gravina entered and remained for centuries under the Western Roman Empire of Constantinople, therefore suffering invasions and plunder by the Saracens (999). 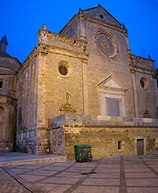 The Norman arrival in the City coincided with its cultural and economic rebirth, which manifested in the construction of the new Cathedral in a Romanesque style and Palazzo Vescovile (Episcopal Building – 11th Century). With the subsequent advent of the Swabians (1194), Gravina acquired major importance in the territory and became a Curia Generale (Episcopal Administration) for the whole of Puglia and Basilicata. Federick II ordered construction of the Castle, which today, one can visit what remains of the building. Gravina became a state and feudal City after the end of Swabian rule by the hand of the Angioini (1266), who were called by the Pope to Italy. It was subsequently entrusted to the Orsini Family, who ruled it continuously from 1380 to 1816. From the 19th Century, Gravina adhered to the Renaissance process, which brought it to the idea of a national state through the Carbonari (An association which promoted independent ideas) clashes of 1820 and the revolts of 1848. In 1861, along with all of Puglia, the City passed over to the Reign of Italy. 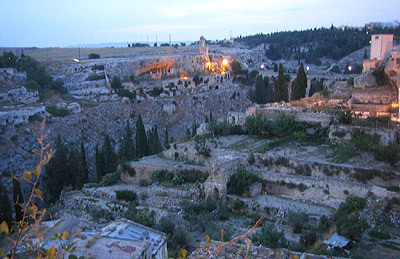 Gravina has a rich testimony of artistic architecture, beginning with its Cathedral and nearby Palazzo Vescovile (Episcopal Building – 11th-12th Centuries). Among the other churches worth mentioning: S. Domenico, S. Lucia, the Madonna of the Grazie Sanctuary and the churches and convents of S. Sofia and S. Sebastiano (1474). Incredibly from the ancient history of the City, one can still admire an intact Roman bridge. Every year in April, the City hosts the San Giorgio Feast; one of the oldest manifestations in the world, being instituted by royal decree of Carlo II of Angiò in 1924. This decree by Carlo, in turn, only re-established a ancient feast.